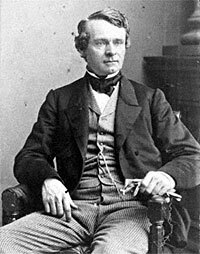 Pennsylvania Governor (Republican, 1861-65), Andrew G. Curtin, was a determined political enemy of fellow Pennsylvanian Simon Cameron and an equally determined supporter of President Lincoln’s war efforts. Curtin was an attorney and advocate of education as secretary of the Commonwealth. He lost the 1854 Senate contest to Cameron, with whom he had long-standing differences on politics, principles, and railroad association—differences which continued for the next two decades. 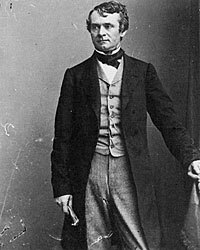 Curtin headed Pennsylvania’s delegation to the 1860 Republican convention, which was pledged to Cameron on the first ballot. Curtin’s feud with Cameron continued and he lost several races before serving as Minister to Russia (1869-1872), a post that Cameron held briefly after he resigned as secretary of war in January 1862. Curtin returned to Pennsylvania and eventually served three terms in Congress as a Democrat in the 1880s. James G. Blaine, Twenty Years of Congressman from Lincoln to Garfield, Volume I, p 306. Alexander K. McClure, Abraham Lincoln and Men of War-Times, p. 258. William Hesseltine, “Lincoln’s War Governors,” Abraham Lincoln Quarterly, Vol. IV, No. 4, December 1946, p. 183. McClure, AbrahamLincoln and Men of War-Times, p. 259. McClure, Abraham Lincoln and Men of War Times, p. 263. McClure, The Life and Services of Andrew G. Curtin, pp. 20-21.